It is well-known the connection between peanuts and heart health, mainly because they positively affect the way the body metabolizes fats; however, the beneficial actions of peanuts for the cardiovascular function have continuously remained a controversial subject among scientists. 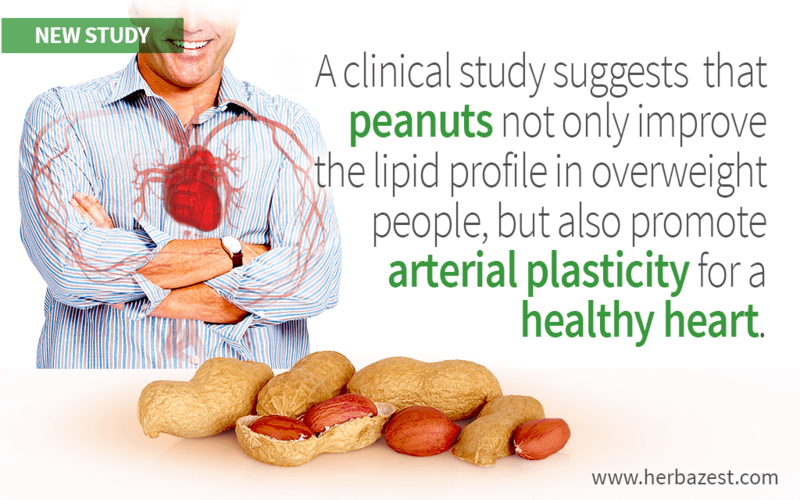 This study presents further evidence of a the strong link between peanuts and heart disease prevention, and it shows that consuming these legumes not only improves the lipid profile in overweight people, but also promotes arterial plasticity. The study was conducted by a team led by Penny Kris-Etherton, Professor of Nutrition at Penn State University, with the purpose of evaluating the effects of short-term peanut consumption as part of a high-fat meal on postprandial endothelial function - or the regulation of the dilation of blood vessels after meals - and therefore its influence on cardiovascular health. After a shake-meal containing three ounces (85 g) of ground peanuts (1,200 kcal) and a control meal matched for energy and macronutrient content, the endothelial function of 15 healthy overweight or obese men with an average age of 26.7 was evaluated. Lipids, lipoproteins, glucose, and insulin were also measured at baseline (0 min) and at 30, 60, 120, and 240 minutes after shake consumption. The meals were given at random times and scheduled approximately one week apart during 34 months. Acute peanut consumption reduced the serum triglyceride (TG) response (levels of fat in blood) 120 and 240 minutes after consumption compared with the control meal. Cholesterol levels (total, LDL, and HDL) as well as glucose and insulin responses were similar between the test meals. However, when compared with the shake-meal, the control meal showed significantly decreased vascular dilation at 240 minutes. The consumption of a peanut-based meal maintained the openness of blood vessels compared to the control meal - which made the blood vessels more closed after eating - so this is a positive result. Even considering the fact that the sample group was small, the results suggest that consuming three ounces (85 g) of peanuts as part of a high-fat meal may actually improve fat metabolism and help preserve endothelial function in healthy overweight or obese men. A balanced diet should also include moderately amounts of nuts, such as almonds, walnuts, and pecans, which can also contribute to improve heart health, regulate cholesterol levels, and reduce the risk of cardiovascular diseases.